It’s Fall, and it’s getting chilly here, so it’s all squash all the time. And this time, it’s a lasagna! 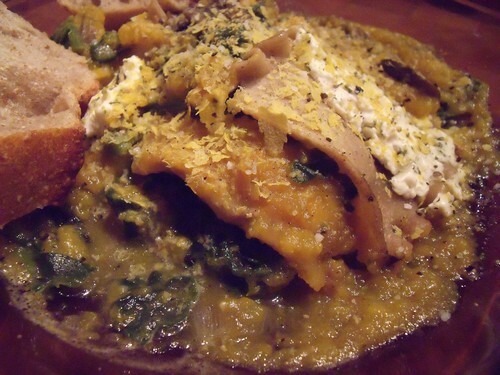 I changed up the squash, and this time sliced a butternut squash lengthwise and popped it in the oven. 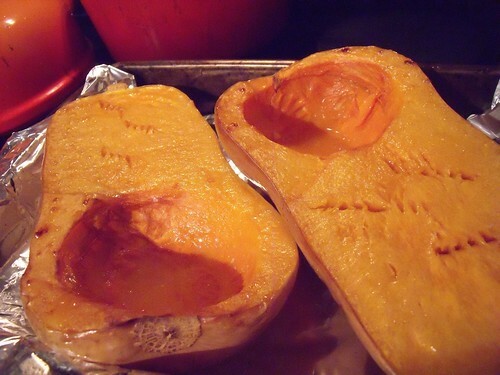 (If you’d like proper directions, check out: my post on how to roast squash). Along with the squash I used a combination of shitake and cremini mushrooms, and a big, fresh bunch of spinach. I recommend serving this with a salad to get an extra hit of veggies in, and you’re good to go. A couple slices of baguette can be helpful to mop up leftover juices. Mmmm. In a medium pot over low heat, heat the milk along with the garlic, nutmeg, and seasoned pepper. Once it has come to a boil, remove from the heat. Scoop the flesh out of a butternut squash and pop it into a blender. Add the infused milk, and blend. In a large pan, heat the olive oil and shallots. Sweat the shallots until they are translucent, about five minutes. Add the mushrooms and sautée until tender. Season with salt and pepper, then top with the spinach. Keep the heat on until the spinach has wilted down, then set aside. 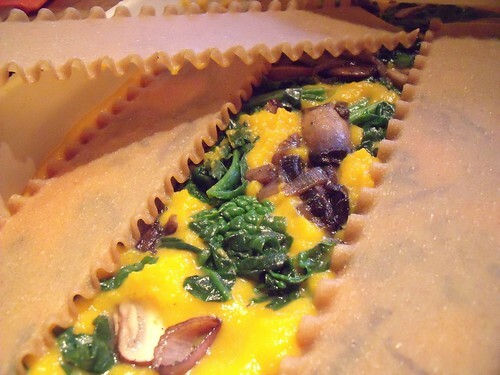 In a large casserole dish, begin to layer the ingredients: noodles, then squash, then mushrooms/spinach. 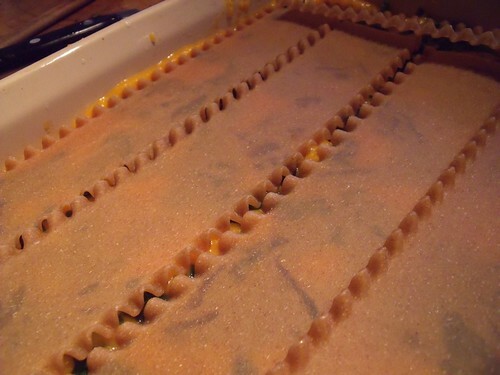 Continue to layer the ingredients until you have run out of veggies, ending with a layer of squash. 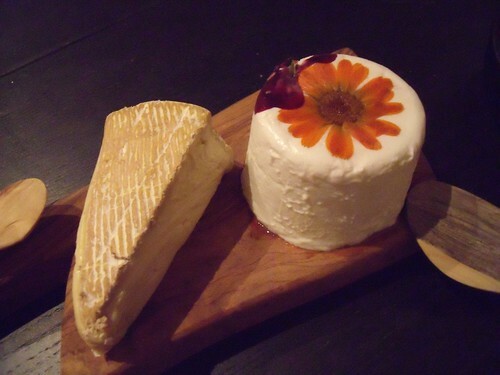 If you are using cottage cheese, sprinkle it over the top of the dish. Cover with the lid of the casserole dish, or aluminum foil, and bake at 400F for 20 minutes. Uncover and bake for 20 minutes more. 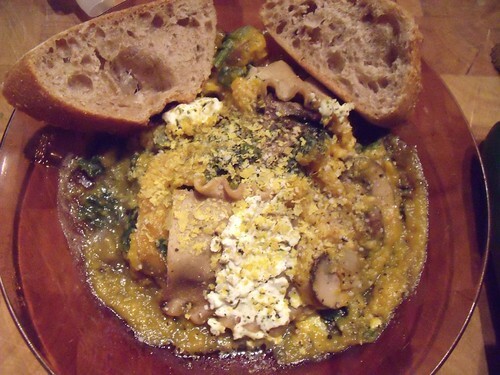 Serve topped with nutritional yeast or parmesan and enjoy!